Russia is looking for ways to prevent an attack on Syria. Russia has called on Syria to transfer its chemical weapons over to international control, in order to avoid an attack from the United States. Washington has reacted cautiously to this Russian initiative. Nevertheless, experts believe there is a chance that this could be implemented — especially if the U.S. Congress votes against military action. “If international control over chemical weapons in Syria can help avoid attacks, we will immediately start working with Damascus,” said Russian Foreign Minister Sergei Lavrov. According to the head of the Russian Ministry of Foreign Affairs, Russia has already submitted its proposal to Syrian Foreign Minister Walid Muallem. Earlier, Lavrov had warned that a military solution to the Syrian conflict would “result in anarchic terrorism” and a growing number of refugees. In addition, he assured that Moscow would do everything possible to prevent an attack on Syria. According to him, possibilities for a political settlement still exist. Moscow will also seek the return to Syria of U.N. experts on chemical weapons as soon as possible to complete their mission, because it has the facts that confirm that this was a provocation. 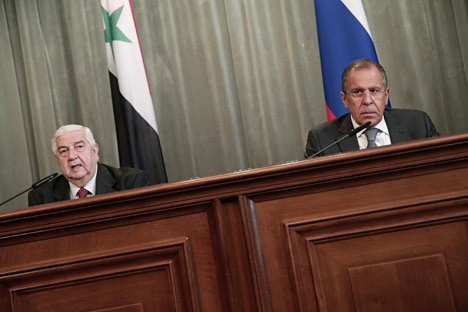 As RIA Novosti reports, Walid Muallem, in his turn, confirmed at a press conference in Moscow that Damascus was willing to take part in the “Geneva-2” conference and to seek a compromise with the opposition without any preconditions. The Russian foreign minister said that Syria was ready for a dialogue with the United States. Muallem emphasized that, if the problem was only concerning chemical weapons, then the issue could be resolved by political means. On the air with Fox News, Obama said that he welcomed the proposal to remove chemical weapons from the Syrian authorities, but the U.S. wanted a “very quick response” as to how serious the Russian proposal was. “We will immediately begin to talk with the Russians and to look at what specific things they have to offer,” said Obama. Experts have different opinions on prospects for the Russian initiative. Yevgeny Satanovsky, president of the Middle East Institute, believes that Obama’s statements are nothing more than a nice gesture. “We are always looking for meaning in the words of American presidents and secretaries of state, but they just decide tactical tasks — to say something bright enough to be written about by journalists. They have no other objectives,” he said. “Everything possible has already been done for a planned attack on Syria; huge money has been paid by Saudi Arabia, Qatar and Turkey. Under no circumstances is it acceptable for them that Assad survives this war — the stakes are too high,” Satanovsky told the newspaper Vzglyad. He believes that the American government is receiving money from the opponents of Assad. The Gulf countries, according to Satanovsky, will pay the U.S. as much as they are asked for, as they do not have the military power of the United States, but wish to destroy their enemy. He noted that such monetary relations had already taken place between Qatar and the French Ministry of Foreign Affairs, as well as with the presidents of the country — first with Sarkozy on Libya, and now with Hollande on Syria. Alexander Vavilov, Extraordinary and Plenipotentiary Envoy of the Ministry of Foreign Affairs and professor at the Diplomatic Academy of the Ministry of Foreign Affairs, holds the opposite opinion. He believes that Obama decided to prepare an elegant and decent option with the cancellation of the plans to attack, in case of a failure in Congress. In this case, Obama will need to save face. “The Americans understand that they have gotten themselves into a deadlock, and now they are looking for a way out of it. If someone was really getting ready to attack, then no one would know anything about it; and, if it is trumpeted in advance, then it is just a PR campaign,” said Vavilov.